Homeowners enjoy the convenience and affordability of lawn care and landscaping services from Giving Hope Lawn Management throughout our service area. We offer a 100% satisfaction guarantee and make getting a quote and scheduling service easy. One chore that many homeowners dread is cutting their grass. The lawnmower gets gas fumes all over you, not to mention the amount of dirt and yard clippings. Even smaller lots seem to take forever to trim up. And that’s precious time out of your weekend! Instead, you could have the affordable lawn mowing service take care of it for you. At Giving Hope Lawn Management, we remain the best in commercial and residential lawn care services for your yards. When you need quality lawn care at affordable pricing each visit, you need us to service your home. Call today for your best lawn mowing service and save more each time! While mowing grass looks like a straightforward process, the average person cuts their lawn incorrectly. Cutting your grass too short or too frequently causes premature burnouts. Most homeowners think that they need to mow their lawns as close to the ground as possible. But that is a surefire way to kill your entire yard! Instead, our team knows the right way to cut your grass every time. We can make short work of even the most overgrown yard, saving you a ton in the process! Whether you need us for monthly lawn mowing or one-time yard cleanups, we are the best choice for your home each time. See why more Richmond, VA, residents continue to hire us since 2011! While some lawn care providers don’t take their work seriously, we remain focused on providing better yards every time. We understand that cutting grass should promote your best yard health, as well as achieving a professionally managed appearance that you’ll love! You can always tell which homes use grass cutting services just from the level of quality that we achieve. There’s no comparison to yards that the homeowner attempts to handle themselves. We have the experience you need for complete yard care solutions. Even something as simple as mowing your grass achieves an even professional finish! Better grass cutting also promotes your lawn’s best growing habits. When you need a lush, thick yard, it begins with better mowing services! Stop wasting time on using cheap lawn mower units from the hardware store. Instead, you can save more by hiring us for your yards each time! If you’ve been mowing your grass each week and you just don’t see results, then it’s time to call in the expert choice for your yards. Call Giving Hope Lawn Management today to schedule us for all your grass mowing needs! We always offer lower rates and better quality of service on all of our available landscaping solutions. 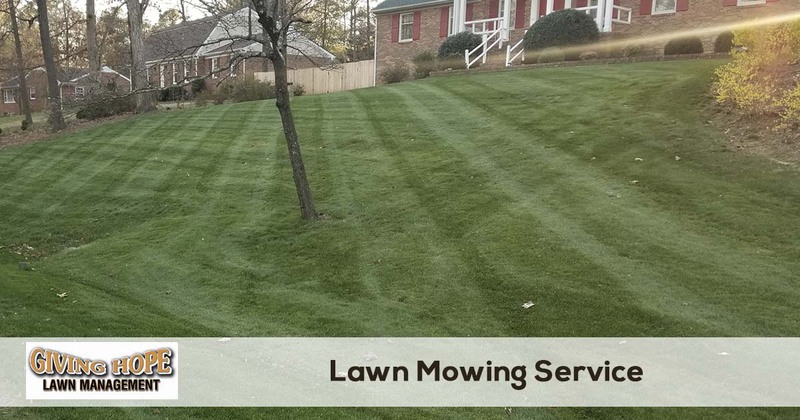 For the lawn mowing services that gets lasting results, you can always depend on us for your yards! For the best residential lawn care services available in the area, you can count on Giving Hope Lawn Management. You can request your free quote online or by giving us a call, we look forward to talking to you.